Solid Gold Foundations - Special commission for Emily. 18 carat yellow gold featuring a clear, light and bright Australian green sapphire supported by cast remnants of the brick foundations of the gallery that these young lovers met in. The addition of small white and champagne diamonds serve as a nod to tradition and emulates the sparkle and magic that defines such significant moments. Golden Path Ring - 18 carat rose gold ring to sit alongside another ring set with a pool like sapphire. The line of the ring undulates to fit in with the other, with a rocky, sandy texture scattered with green sapphires and white and champagne diamonds. 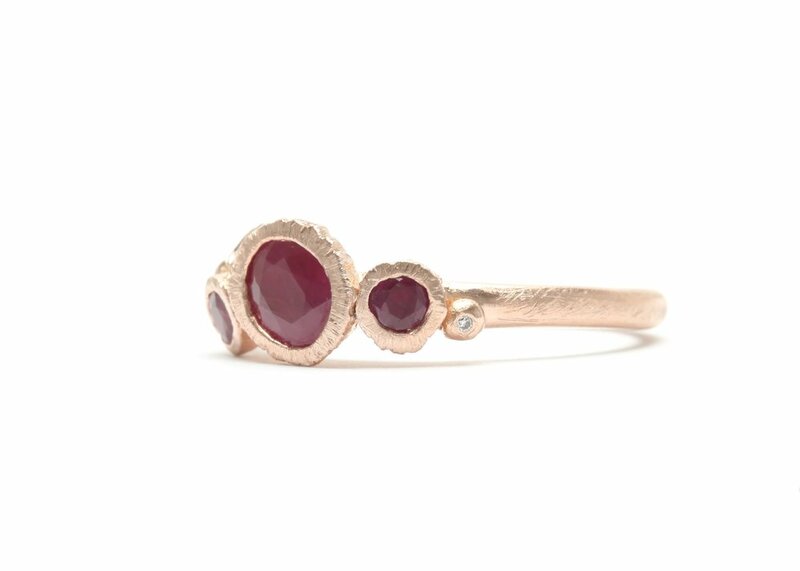 Custom Rocky Reef ring in 18 carat rose gold with clients own rubies, and white and champagne diamonds.